Surfing For Life is a documentary about healthy aging and life-well-lived from the unique perspective of 7 male and 3 female surfers who have been surfing since the 30’s, 40’s and 50’s and now range in age from 60 to 93. 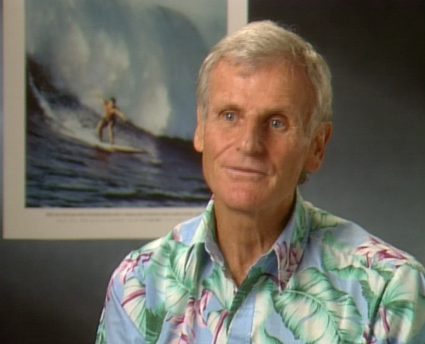 Through interviews centered on key aspects of healthy aging, along with archival and present day footage of the film’s subjects surfing and living their lives, an entertaining image of successful aging emerges. For surfers and non-surfers alike, this video celebrates life and encourages the viewer to pursue whatever hopes and dreams inspire passion. From a gerontological point of view, Surfing For Life is an intriguing exercise in applied gerontology and can serve as a springboard for discussion about holistic aspects of healthy and successful aging. The interviews touch on many of the hallmarks of successful aging such as exercise, diet, reminiscence, intergenerational involvement and mentoring, healthy acceptance and management of the physical changes that come with growing older, stress reduction, family relationships, long-term friendships, a sense of community, being of service to others, spirituality, an elemental connection with nature, and joyful peak experiences. The video leaves viewers with a renewed sense of the human potential of later life and provides a powerful alternative to the largely negative view of the capacities of older people held by many in our youth dominated society.